More and more web traffic now come from mobile devices. Users are relying on their smartphones, tablets and other mobile devices to stay connected and get the information they need. This makes mobile marketing a very essential instrument to use when promoting your site. 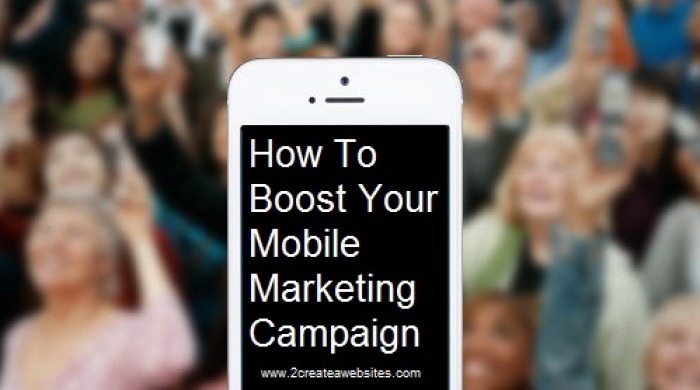 To start boosting your mobile marketing campaign, here are a few tips you can use. You can use a responsive web design for your site. A responsive website design will deliver your web page content differently, depending on the size of the users screen or their screen resolution. When you have a responsive design your site will look good on any device its viewed on. A standalone mobile version can provide users with better overall user experience, but you need to make sure that the mobile version gets called when the site is opened using mobile devices. Both ways have their own advantages and disadvantages; there is no rule regarding which method to use as well. Simply make sure you can provide the best mobile viewing experience to increase the effectiveness of your mobile marketing campaign when you create your website. You can use text messages to reach new audience and keep existing visitors interested. Instead of promoting products and services directly, you can promote links to resources that users can actually benefit from. This will persuade them to visit the site more. Freebies, discounts and bonuses could also be promoted through text messages. Make sure you prepare a good and attractive landing page for the promotional offers you are sending out. Fine-tune the landing page to increase conversion rate. When you do promote your products, services and special offers using mobile marketing tactics, make sure users can make a purchase easily. This means supporting mobile-friendly payment gateways and designing a user-friendly checkout process. Another good way to increase your conversion rate is by implementing one-click checkout. Get only the essential details from users and allow them to complete the checkout process is less than a minute. Text message is just one way of connecting with mobile users. Email marketing is also a good approach to take if you want to reach the mobile market. Most users now open their emails using smartphones and tablets, so it would be highly effective if you make your newsletters mobile-friendly as well. Creating a mobile-friendly newsletter is just as easy as creating a mobile-friendly web page. Today’s best mailing list platforms even have templates of responsive emails you can use right away. These responsive emails work well whether they are viewed on a desktop or a smartphone. Services such as Mailigen even allow you to target mobile users specifically. You can create a list of users who frequently open your newsletters on mobile devices and fine-tune your mobile marketing content to suit their needs and preferences.